We entered Argentina by taxi from Brazil and the first thing you see is a large sign saying the Malvinas are Argentine. Oh Well!. 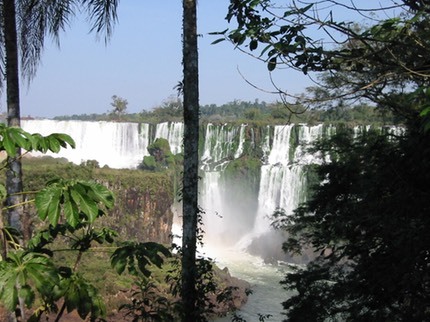 The Argentine side of the falls is better developed and has more to see so we spent 2 days wandering the falls and trails before moving onto Buenos Aires for a 5 day stay. We had planned to visit Uruguay but it was too cold so we ended up fleeing north to the warmth of Venezuela. I also saw a couple of Toco Toucans, which are the type used in all the Guinness adverts from early in the 20th century. I was well impressed. Pictures will never do justice to the falls here but this one typifies what you see. Hundreds of individual falls pouring thousands of gallons of water over multiple drops into a fast moving river in the canyon. There are jet boat trip under the cascades as well. It is a very well visited area and coach loads of tourists abound. The birding is pretty good too and we managed to see quite a few monkeys when we ventured off the beaten track. An 18 hour overnight coach trip with full onboard food and drink service (£18 all included) took us to Buenos Aires where we bagged a £10 a night hotel that included breakfast. This was to be the theme of Buenos Aires as everywhere we ate threw in free drinks. The economy here was absolutely shattered with the result that it's still very cheap and competitive. 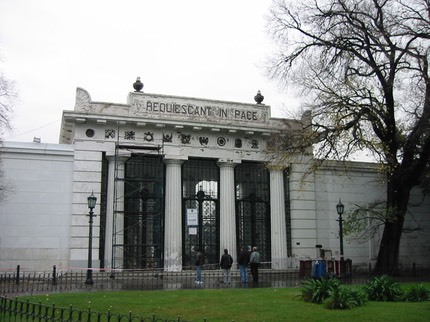 This picture is the entrance to the cemetery where Evita is buried. Unfortunately we couldn't go in as it was shut for maintenance. I asked the office staff there, "what time does it open", He replied " July the 8th….". We did visit the one where Peron is buried the following day. 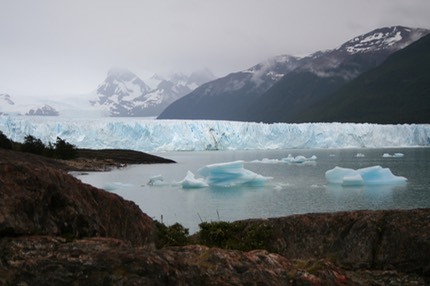 Our second visit to Argentina combined Patagonia with a trip to the Antarctic. With a few days to spare in Buenos Aires we visited the now opened Recoleta Cemetery to see the Duarte family tomb. 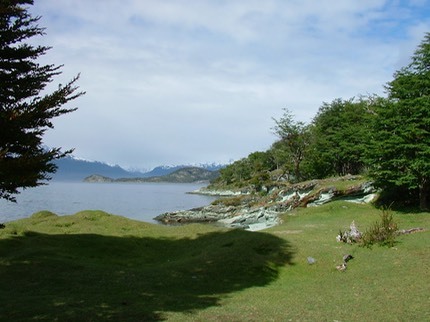 Tierra del Fuego National Park, accessed from Ushuaia is stunning with plenty of well marked trails. The birdlife is impressive and everyone is after the star sighting of the Magellanic Woodpecker a huge beastie, black with a bright red head. If you watch your Attenbouroughs then this is the bird you can call in by banging 2 stones sharply on a tree. They are very territorial so come to investigate. We secured good sightings of these and plenty of other species. El Calafate is the gateway to the Glacier National Park with loads of great glaciers pouring out of the Andes. The Perito Moreno is the most famous and has this year breached the lake by reaching the far bank which will lead to a huge ice rush in March as the water pressure becomes too much for the ice to hold. We trekked on this and were rewarded with whisky on the "glacial" rocks. A boat trip brings many other glaciers into reach - everyone different. We rode some horses here on the river flood plains which was fun. San Martin de los Andes is in the lake district area of Argentina and sits prettily on a lake on which boat trips are available. We found a kayak company and had a pleasant few hours on a couple of other lakes in marked contrast to the kayaking in Antarctica. For our 3rd visit (Oh Yes.) we headed through BA once more then north west. 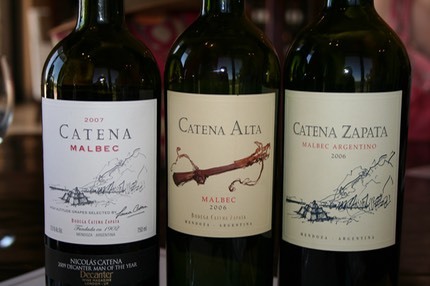 This visit to Argentina concentrated on the north-west of the country, around Salta and Mendoza. From Salta we had 3 days with a birding guide. 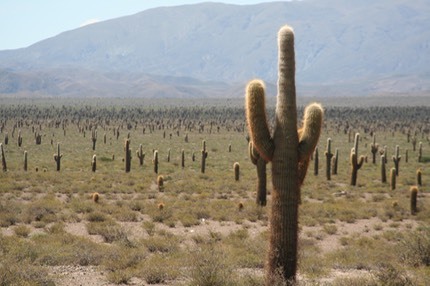 It wasn't entirely to Jonna's liking as she had expected a hike, but we did get to see this unbelievable cactus forest high in the Andes.There were thousands of them. 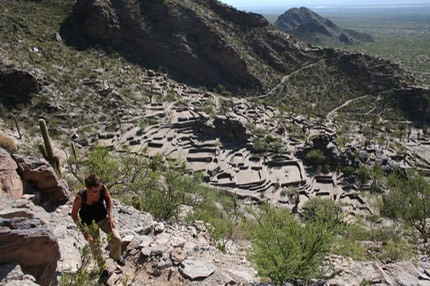 South of Salta are the ancient ruins of Quilmes (same as the beer). Whilst not on the scale of Macchu Picchu they are very interesting, and actually blend in to the hill side in a feat of camouflage. 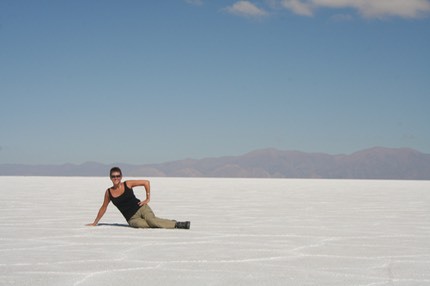 Also high in the Andes are salt flats, that are still actively mined. We were able to take a long circular walk from the hire car which we parked on the edge of the flats. There were some people camping on the salt as well. 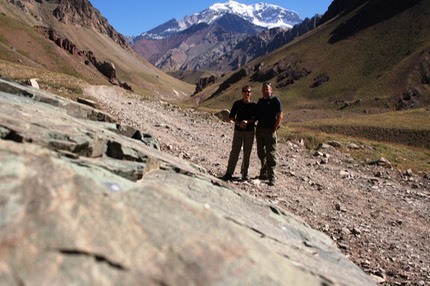 One of the trip highlights was the drive from Mendoza out to Aconcagua, the highest mountain outside the Himalayas. At nearly 7000m it is an impressive site. We paid our money for a climbing permit to base camp and set off on the 3 hour hike up to 3500m. You just have to keep going in a steady plod.